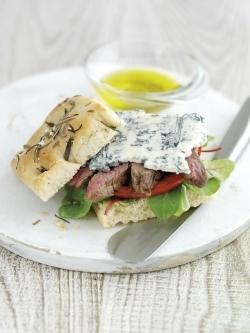 This Gorgonzola Focaccia Sandwich recipe is an Italian twist on a classic steak sandwich and is so simple to make. The recipe combines Gorgonzola cheese, a product of Protected Designation of Origin (PDO) with Scotch Sirloin Steak, a product of Protected Geographical Indication (PGI). Simply marinate and fry the steak. Bake the focaccia rolls and finish with salad, beef tomato and plenty of Gorgonzola piccante. Delicious! 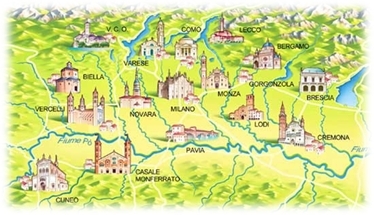 By law and tradition, Gorgonzola cheese can only be produced in the following provinces: Novara, Vercelli, Cuneo, Biella, Verbano Cusio Ossola, and the area of Casale Monferrato within the Piedmont region, and Bergamo, Brescia, Como, Cremona, Lecco, Lodi, Milano, Monza, Pavia, and Varese within the Lombardy region. Only high quality cows’ milk produced in these provinces may be used to make Gorgonzola and to grant the cheese its PDO certification. PDOs are defined and protected by European Union law in order to defend the reputation of national foods. 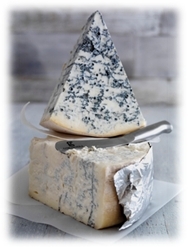 Gorgonzola has excellent nutritional properties; it is extremely rich in vitamins and minerals such as calcium, iron and phosphorus. It is also a highly versatile product which can be used in a wide range of recipes including appetisers, main courses, and even desserts.